The most recent gift from the U.S. Library of Congress to the world is a collection of more than 2,500 stunning Japanese woodblock prints dating from the 17th to the 20th century. Hundreds of works by many of Japan’s most revered artists from the “Fine Prints: Japanese, pre-1915” collection are now available online and free to anyone who wants to download them. Daily life, landscapes, actors, foreigners and scenes from Japanese literature and theater are depicted by artists such as Hiroshige, Hokusai, Kuniyoshi, Sadahide and Yoshiiku. 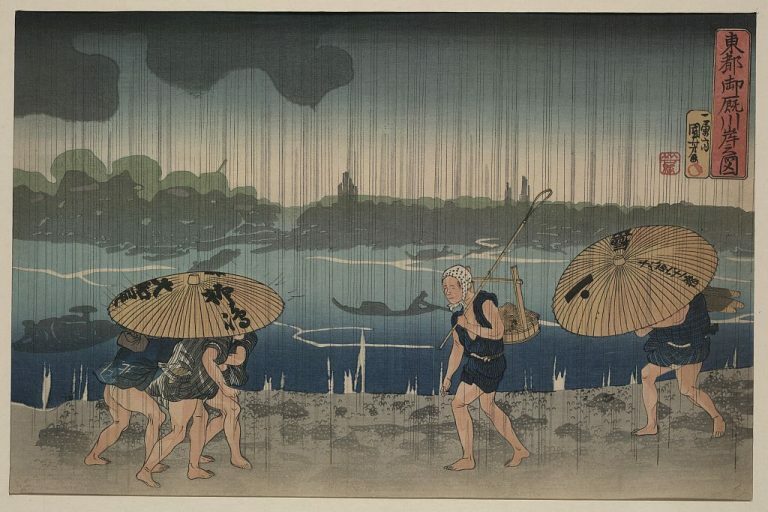 This woodcut print by Utagawa Kuniyoshi (1798–1861) shows people walking beneath umbrellas along the seashore during a rainstorm, a slice of life in 19th century Japan. 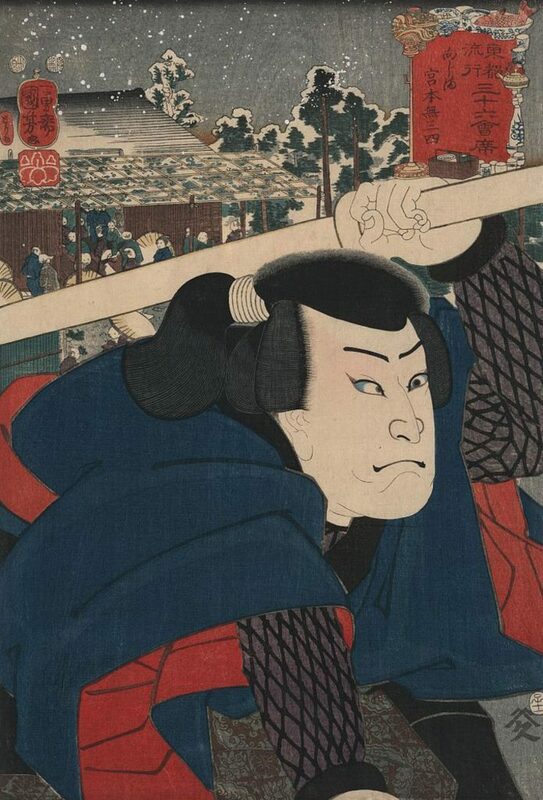 In another print, Kuniyoshi combines portraiture and landscape. Famous swordsman Miyamoto Musashi is depicted against the backdrop of Mukôjima gardens in Tokyo. It is in the Ukiyo-e tradition, or “pictures of the floating (or sorrowful) world,” which influenced Impressionist and Post-Impressionist art in the West. The Ukiyo-e tradition celebrated women, Kabuki actors, folk heroes and natural beauty. 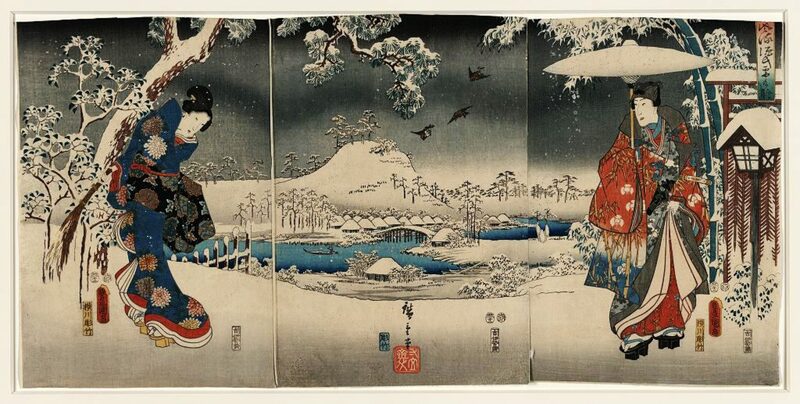 This joint work by Utagawa Kunisada (1786–1864) and Utagawa Hiroshige (1797–1858), “Fūryū genji yuki no nagame,” a modern version of the Tale of Genji in snow scenes, is typical of Ukiyo-e. It depicts a woman with a broom and a man holding an umbrella. Japanese artists were intrigued by foreigners. 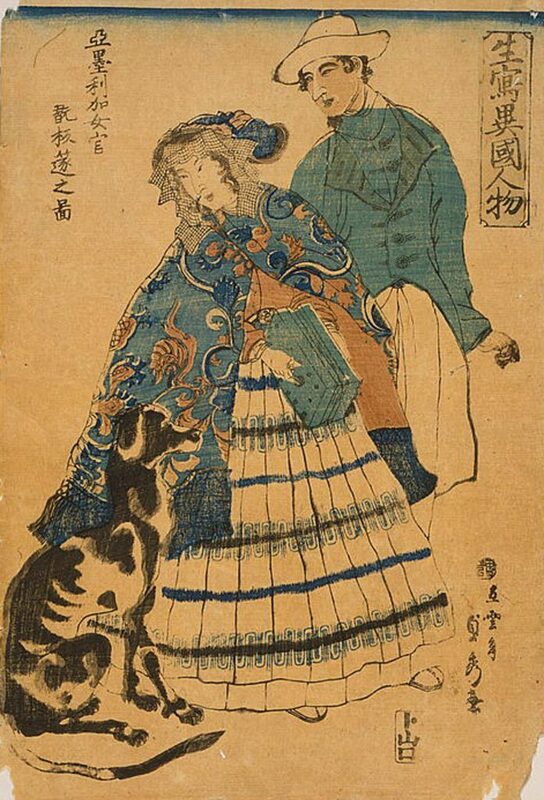 In “Americaka jokan hansui o gansuru no zu” by Sadahide Utagara (1807–1873), an American woman playing an accordion and her male companion look at a large dog beside them. Hokusai Katsushika (1760–1849) depicted nature and Japanese life. One Hundred Views of Mount Fuji is among his famous works. 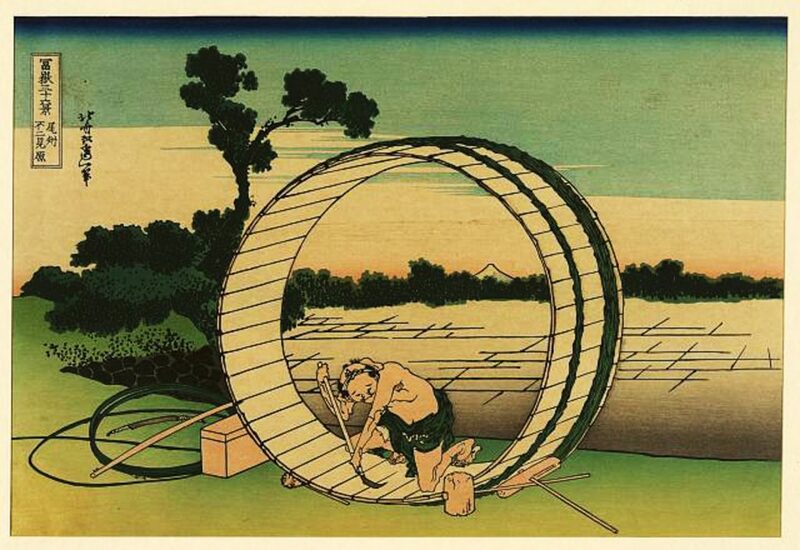 In this print, “Bishū fujimigahara,” Mount Fuji is visible behind a cooper applying varnish to the inside of a large barrel.